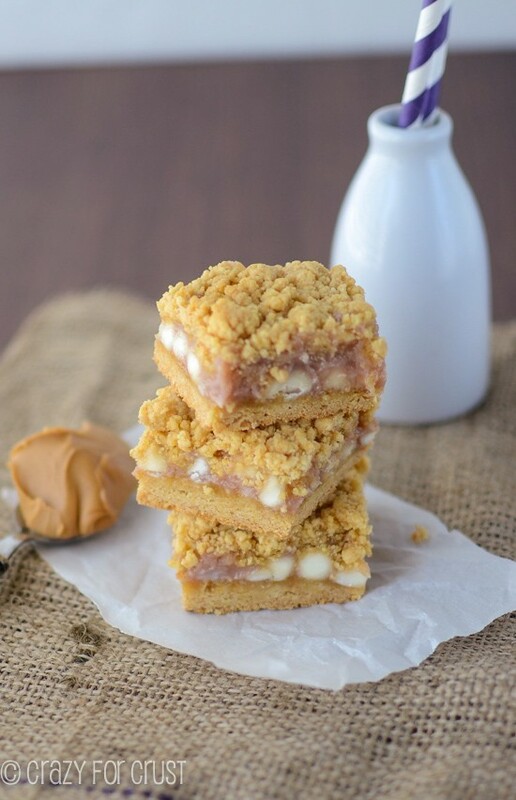 These Peanut Butter and Jelly Gooey Bars are the perfect snack to get your kids in the mood for school! 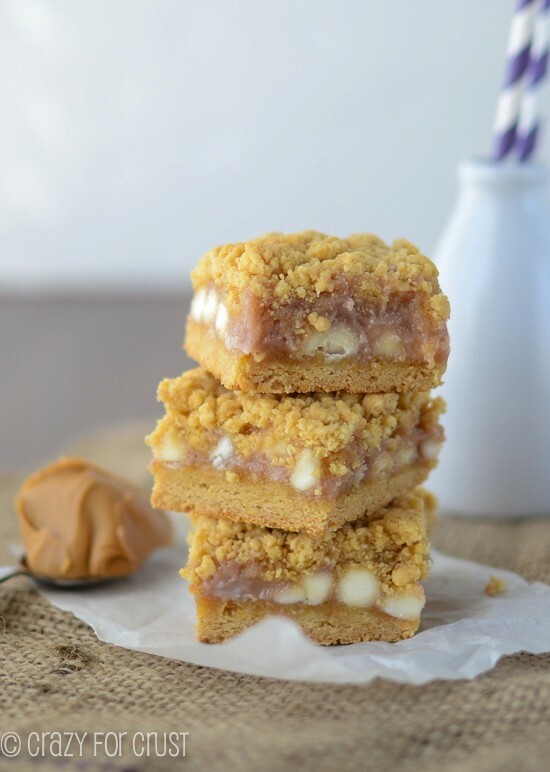 They have an easy peanut butter cake mix crust and topping and are filled with a gooey sweet PB&J filling. It’s Back to School Week here at Crazy for Crust! It’s a weeklong celebration of school! Well, almost. She starts next week…but I’m getting the party started early. Gotta be prepared! There’s nothing like a summer to make you realize that working from home with a child on vacation is HARD. How do y’all do it with young ones? OMG. I’ve come to realize that I really am a “work at home mom.” In the past, I considered myself a SAHM, who blogged. After reviewing everything this summer, I realized that I’m a WAHM…and a SAHM. Those are two really hard jobs to put together. Jordan has spent the summer at a lot of camps, a few playdates, and with a lot of TV. Back to school. It’s the season of new. New clothes, new backpack, new teachers and books…and new promises to pack better lunches and make snacks from scratch. 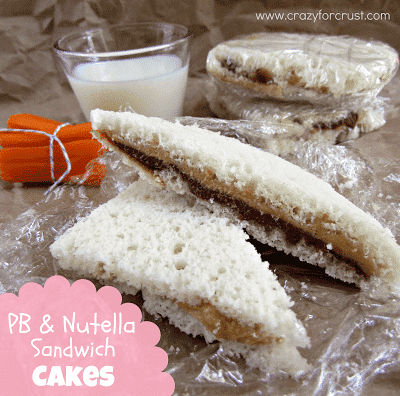 And…it’s the season for PB&J, and new PB&J treats. 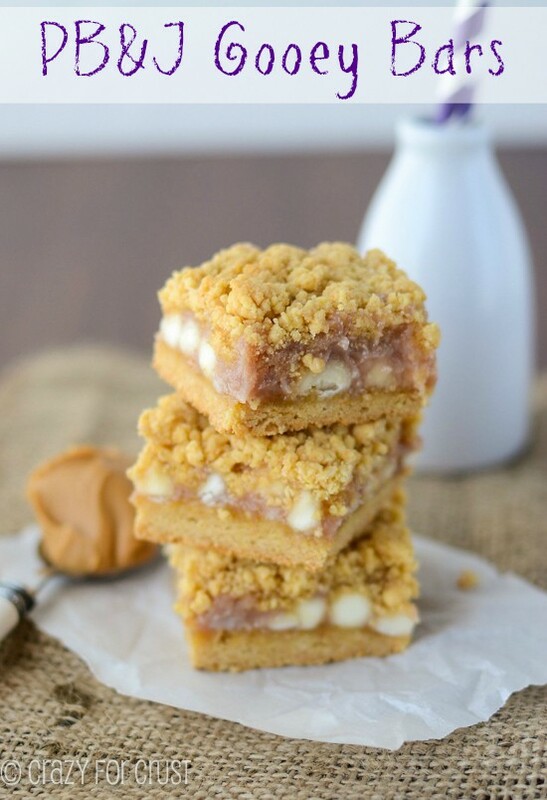 Like these Peanut Butter & Jelly Gooey Bars. I’m kind of on a Gooey Bar kick. I’ve made Healthier Chocolate Gooey Bars and Funfetti Gooey Bars and I have so many other gooey bar recipes too! They are just so easy to make and are so versatile! I have a few more ideas up my sleeve, so keep an eye out for those! 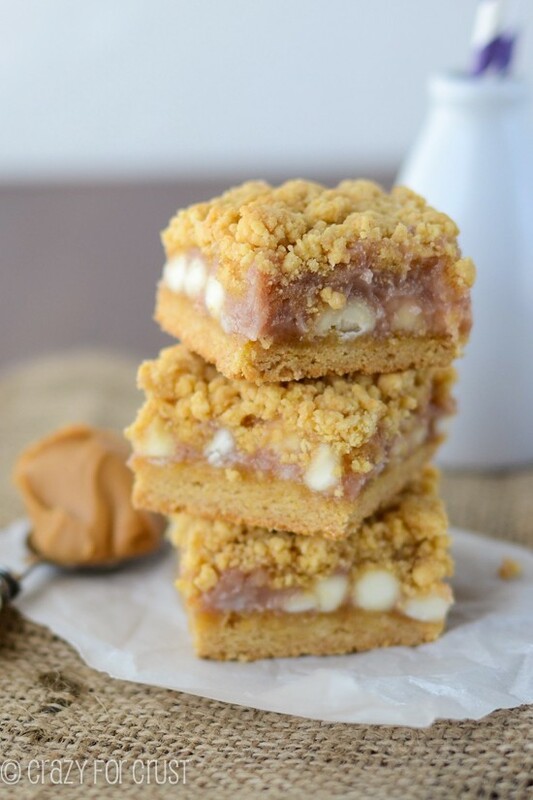 Being Back to School Week, I naturally thought of PB&J Gooey Bars. Peanut butter and jelly seem to be iconic this time of year. I’ve never been a jelly or jam person, until recently. One day I was craving something so bad and somehow I realized I was craving jam on toast, even though I’d never had it. Like all Gooey Bars, these start with a cake mix. The mix is made into a “crust” and pressed into a pan, and is then topped with sweetened condensed milk and other goodies. Instead of using the traditional butter and egg combo for the crust, I used peanut butter and egg for this PB&J version. These are very peanut buttery! The sweetened condensed milk got whisked with some seedless strawberry jam. Why it’s purple? I don’t know. But you could use grape or blackberry, or use jam or jelly. Whatever you have on hand works great! I wanted to use peanut butter chips in this, but realized I was out half way through making them, so I used white chocolate chips and wrote the recipe to reflect either addition. I know that some of you can’t get peanut butter chips, so use what you have on hand! These are my favorite gooey bar so far. I brought these to a PTC meeting and everyone loved them and can attest that I ate way too many of them myself. I’d meant to freeze some for the actual start of school. Yeah, that didn’t happen. It just means I’ll have to make them again! Or, at least, another version. 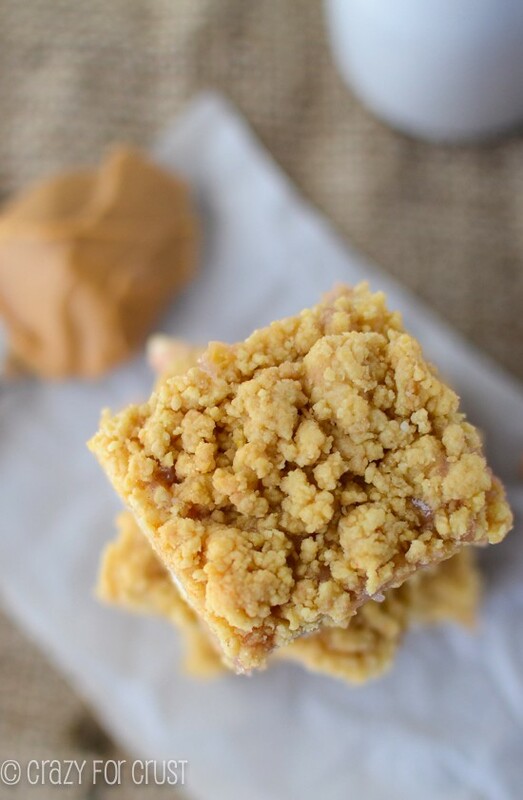 I’m going to be celebrating school all year long…with more gooey bars! With a hand mixer or electric mixer, beat eggs, cake mix, and peanut butter until mixture is crumbly. Press about 2/3 of the mixture into prepared pan. Sprinkle white chocolate or peanut butter chips over the crust. Whisk together the sweetened condensed milk and jam in a measuring cup or small bowl. Pour over the chips and crust. Sprinkle the rest of the cake batter mixture evenly over the top of the bars. Press lightly to compact. Bake for 25-28 minutes, until top just starts to get golden brown. Cool completely before slicing into bars. Be sure to come back all week long for more Back to School Week treats! Up tomorrow: an easy breakfast idea using one of my favorite cereals! Oh I love gooey bars, cannot wait to try these out! Love the pics too!